Faraway Press: The Online Home of John Jackson Miller: Knights of the Old Republic #47: The secret's out! 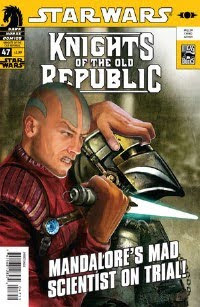 Knights of the Old Republic #47: The secret's out! Which secret, you ask? Ummm... several? Numerous? It's just the start — and it's the start of "Demon," the final storyline in the Knights of the Old Republic comics saga. Issue #47 goes on sale in fine comics shops most everywhere Wednesday. Exercise caution in approaching message boards where the spoilers will be abounding! I've also finally added the site page for the eighth trade paperback, "Destroyer" — now available for preorder at your local comic book emporium or at Amazon. Read, absorb, enjoy — and check back here where I'll have some thoughts online about the issue soon. I'll go ahead and say that there are enough revelations yet to come that I probably won't be able to address a lot of questions; later chapters elaborate on a lot of what we see in this issue. But there should be plenty enough to chew on! This series has been a lot of fun — and the fun is still going!